enlist in the Black Horse. words I'm goiug to say ? name I'd wish to know ? o me before you go ? Since I left the Shamrock rShoe. To the maids of the Shamrock Shore. In praise of the Shamrock Shore. Maiden, why so sad & lonely. Maiden, why so sad and lonely? Why those oft repeated sighs ? 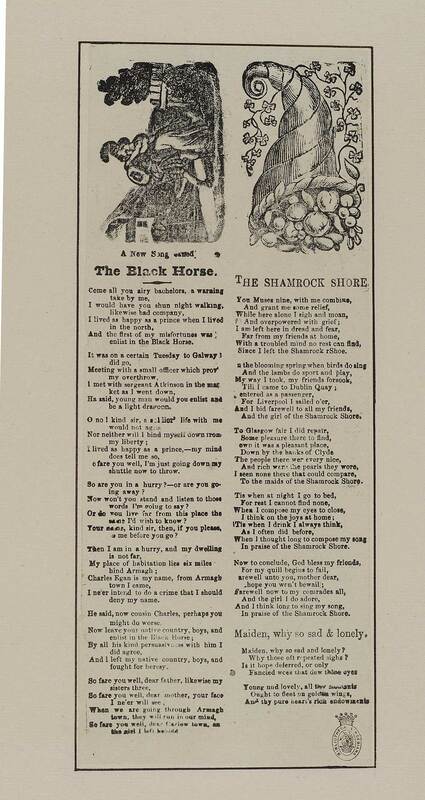 A new song called The black horse - first line reads: Come all you airy bachelors, a warning/ take by me. The shamrock shore - first line reads: You muses nine, with me combine. Maiden, why so sad & lonely - first line reads: Maiden, why so sad and lonely.